Getting nowhere with modes and scales? With over 50 years of on the bandstand performance and teaching experience, Robert Conti will take you wherever you want to go. No Modes No Scales®, no BS since 1966. 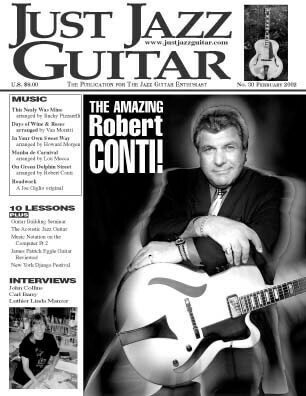 His knowledge available only locally until the launch of his website in 2000, Robert Conti single-handedly raised the bar on jazz guitar instruction. Read the interview that started it all. By now you've discovered an endless line of unqualified amateurs who attempt to take your money, or worse, your time, by falsely presenting themselves as "professional jazz guitar educators" when there's zero evidence they can even play. Caveat Emptor - in your search for a high quality learning resource, don't allow yourself, or your wallet to be ambushed by a litany of ludicrous and unverifiable claims - all intended to exploit your learning frustrations and induce you to purchase what usually proves to be yet another junk product full of regurgitated modes, scales, and meaningless theory. Whoever is getting this, I hope it gets to Bob, ’cause I wanna say: you are an amazing player. I’m in the New York area, and have watched, studied, enjoyed the best from Joe Pass on…there are so many, and you are certainly a master! So hard to believe I haven’t seen more of you! had the experience of being given some abstract concept, and then told: "now, you need to go figure out how to make jazz out of this concept,"
...then you're for the Conti approach! Like the early Founding Fathers of the art form, the high level of Robert Conti’s playing skill is the result of NOT studying modes, scales and theory. Before spending your money, or even your time (yes, free lessons do have a cost) on the army of hack instructors that permeate the internet, do take the time to watch the two short performance videos below to witness the raw skill that underwrites the Conti line of learning resources. Conti brings 50+ years of documented on the bandstand experience to the table. Having developed his skill as a monster player at only 24 years old, coupled with countless student success videos and letters of praise, are your assurance of quality and result-producing products that will improve your playing. If you’re serious about playing jazz, acquire an archtop backed by 50+ years of performance experience. 24 frets, Ebony everything, personalized introduction video, and best of all, it’s got the Conti name. See photos, comments and videos from our worldwide owners. If your goal is to play jazz guitar, it makes sense to choose a teacher whose students can play. Watch confidence in action as our students play what they learned from Conti. Endless commentaries featuring real names and locations of students. You won't find any of the typical fake Joe B. and Frank R. comments like you find on other sites. All of our commentaries are genuine. 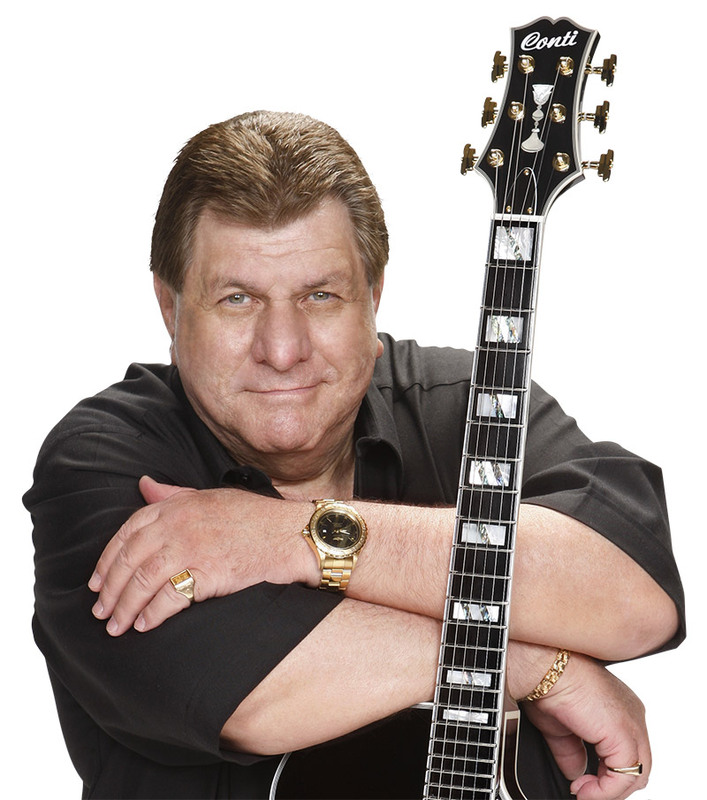 Having received accolades at the local, national and international level, Robert Conti remains at the forefront of jazz guitar. Take the time to read numerous press reviews on his performances and products. Back when I was coming up, it was just us with our guitars. We played jazz guitar to learn jazz guitar and nothing else entered the equation. Turn jazz into an academic endeavor and you’ll never become a player. If you’ve had your fill of daily blog posts, tons of disjointed free lessons on Youtube, academies, conservatories, eBooks, workshops, forums, discussion groups and you still can’t play – come see me and my students. Tired of disjointed 5 minute lessons that lead you nowhere? Experience 3 full length complimentary video lessons. Like thousands of others since 2000, you’ll be glad you did. And no, this isn’t the beginning of daily spam in your inbox. Send My Test Drive Lessons & Coupon!